I always love vet day! I always have a million questions. 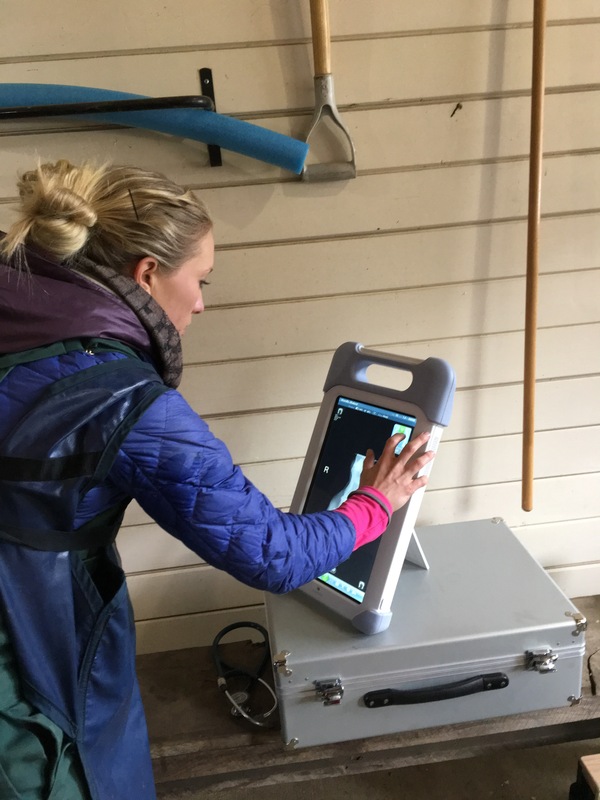 It’s even better when your vet is also at your endurance rides, has ten years of competing and riding experience, two fabulous endurance horses herself and understands the challenges and ins and outs of the sport we’re trying to participate. Wild Heart got her first dental visit and Kelly found one remaining wolf tooth along with some hooks and points to file down. For the non horse owners: horse’s teeth continue to grow most of their life… they get worn from constant grazing in a way that over time can mean sharp edges and ‘hooks’ this can be uncomfortable while being ridden, it can make their jaw get kind of stuck (hooks) while eating (also uncomfortable) and they can develop ‘waves’ where their teeth don’t meet correctly all the way through their mouth making it hard to grind their food well and get all the nutrients. No. Horses in the wild do not see a dentist. 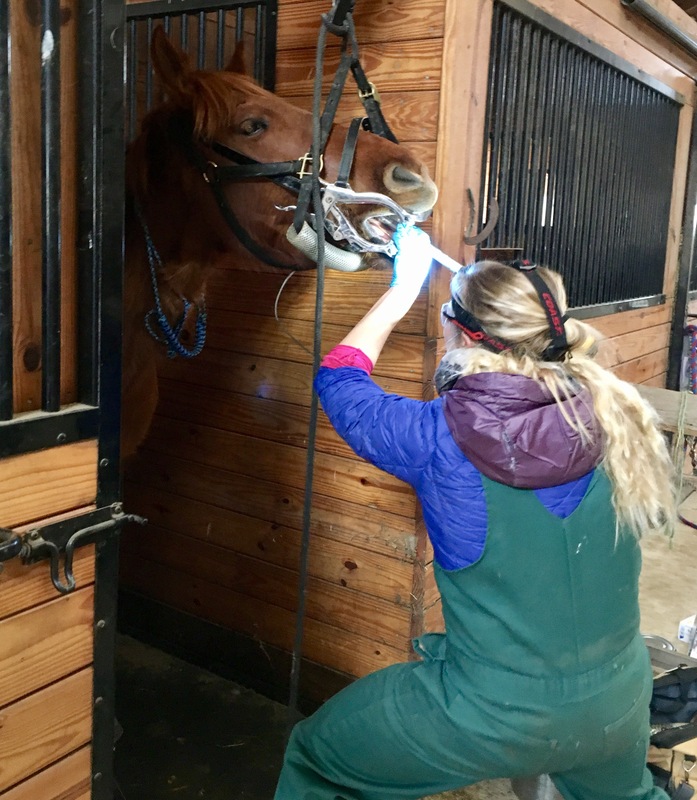 However horses in the wild don’t usually live to 20 years, and they aren’t asked to carry riders around, and they’re much less comfortable in their head-jaw-mouth than one who gets dental care. The wolf teeth is a little bit like a human’s wisdom teeth. 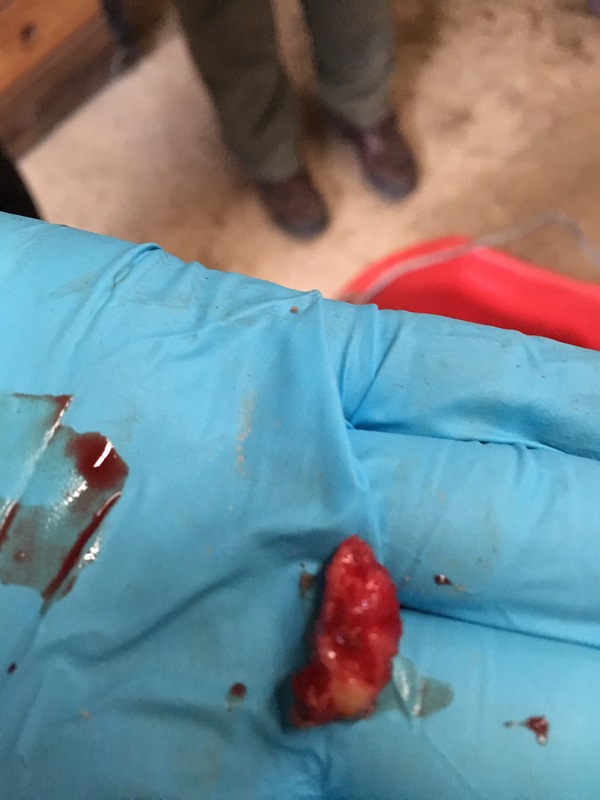 They are in the back of the mouth, aren’t really necessary, not every horse has them and they are in a place that can get clunked by a bit which is a big reason to have them removed. Wild Heart was ok at the walk with the bit but would toss her head the day we started to trot. Though it could have been a handful of reasons- wolf teeth were my first guess and the easiest to solve. So it was good to find one! … and remove it. Khaleesi is at the early stages of what I hope will be a long successful endurance career (including Tevis someday if we are good enough and lucky as well) and young enough to still be developing. As I get one thing down another needs attention to ensure she’s at her best and I’m doing the best to keep her healthy in a rather extreme sport. My biggest concern for her last year was saddle fit. Now that we have that going well this year is the hoof puzzle. 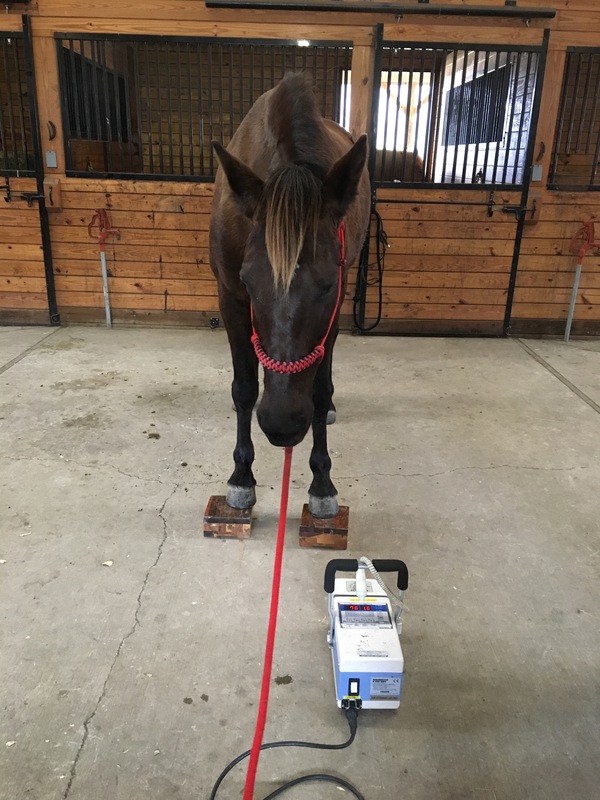 I asked them to bring along the X-ray machine because I felt after two years of educated guessing and trial and error it was time to get some better data on why her feet are just not quite right. I picked her up as a 4-yr old July of 2014 basically feral. I didn’t think much about her feet at all- positive or negative. When I began ponying her on my wooded trails I used to call her the anchor because she was so slow – not even carrying a rider. Over time (about 2 years) the more I protected her feet the better she would do. First hoof boots helped, but they wouldn’t stay on. Then metal shoes- she increases speed and willingness. Then we add pads and she’s really doing well. At the end of last season I opted to leave the pads off- I saw them as extreme for the super technical rough riding like the Old Dominion, but not necessary for ‘normal’ rides. This brings us to the Iron Mountain ride in August where I pushed her through 50 miles – with a lot of rocks and hard surfaces- with metal shoes only. I thought she was being obstinate (we didn’t always have company on the trail and I struggled getting her to leave the vet check alone both the 2nd and 3rd times). I pushed her to go and she grudgingly did, but it cost her. Finally I got the picture and on the last 15 miles or so we walked every rocky patch and trotted when we could on soft ground. Thankfully early that morning, the best wooded footing, and cool weather we’d breezed into the vet check quite accidentally with the top 5 riders. So even walking much of the last loop we still finished in plenty of time. 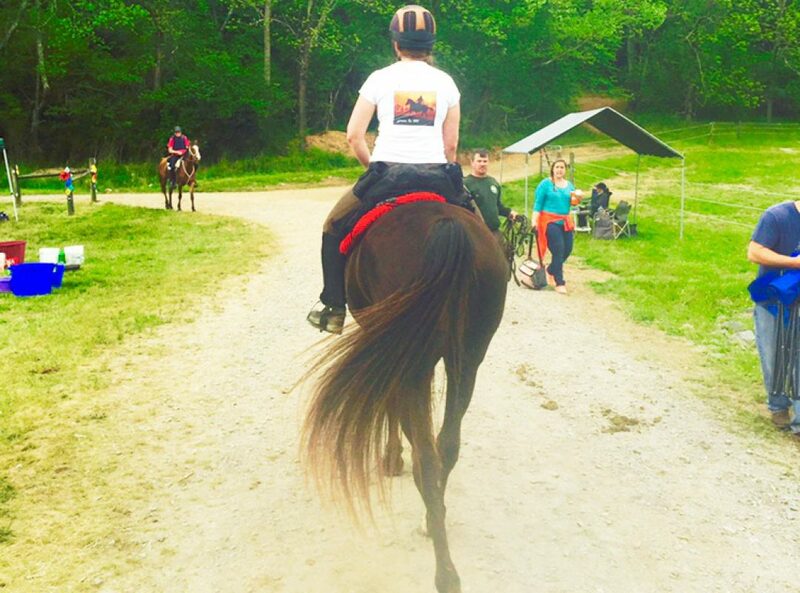 And we were given a gift of finishing because though my horse wasn’t lame – she was hurting. I was pretty sure we wouldn’t pass, and with the pain in her feet her heart rate would rise and wasn’t coming down enough. That day it was like she knew what to do and we got into the check and she trotted out the best she could on the hard dirt and her heart rate fell enough to be sufficient. We were given a “C” due to ‘attitude’ and ‘gait’. To be lame it is able to be attributed to a specific leg/foot. She was just a little off all over as if she was pretty exhausted. The vet wondered if we should have electrolyted more- I won’t say that isn’t a factor. But now I really know: it was her feet. After iron mountain… her feet were super sore. She was a walking disaster for a day and I felt terrible. Then she took a good 2 weeks of pasture rest at home before she was completely back. She is not regularly lame, but there have been times she’s ranged from not quite right to actually lame and now I look back and am fairly sure it originates in her feet. We don’t find heat or swelling in the legs or shoulder. She heals up with a couple days or a week of pasture rest. The boots are not enough, and shoes alone are not even enough. 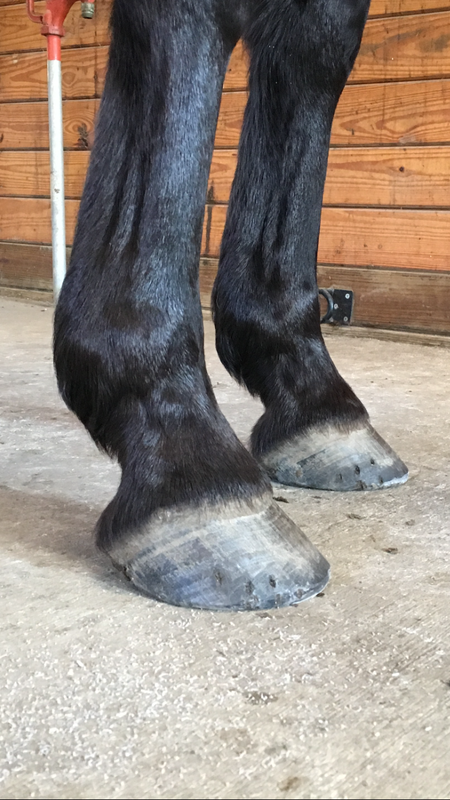 My readers may recall that a social media group took a look at her hoof photos and said her feet are too long/narrow with her heels not supporting underneath her body enough (especially barefoot). Wait? Why is she barefoot? #1 it’s good to give horse’s feet a chance to ‘rest’ and get a break from metal shoes. That shoes can constrict growth and expansion/contraction that is good for the hoof. #2 we usually get enough snow here that accumulation of ‘snow balls’ in their hoofs which is more likely with the metal shoe can cause some damage – also I like to ride in snow! #3 it’s ‘off season’ so she is in lighter riding and more downtime anyway, so pull the shoes and give her feet a break. Problem is that I can’t ride her barefoot, so I need hoof boots. And at first my hoof boots always came off because her hoot is a long narrow (not really balanced shape). Besides that I’ve found even with the hoof boots on she is still sensitive to rocks. So this winter I filed back her toes. Her hoof angles are more correct now and structurally can support the concussion better – but Kelly believes she has a small foot proportioned to her body and now that I made her foot even smaller by filing back her toes (which was probably a good thing to do now in the down season) she has less surface area to disperse the impact. 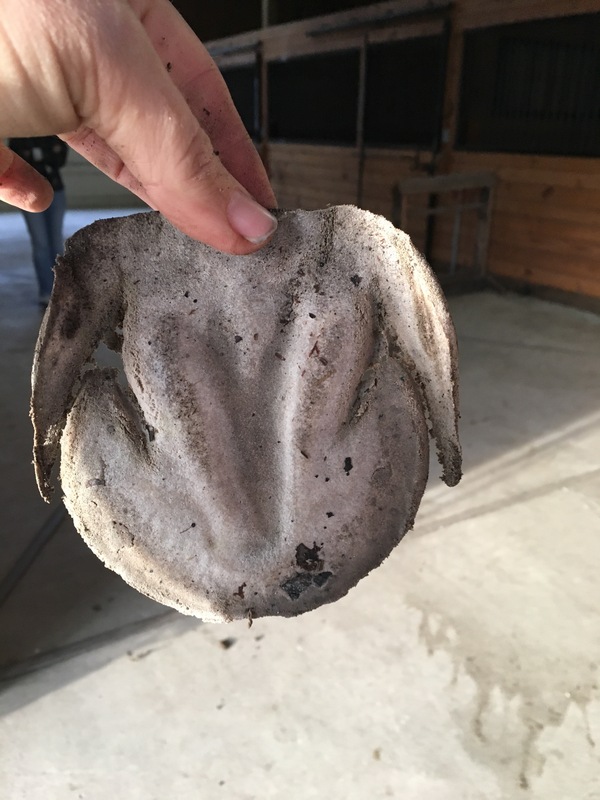 This means though she’s not pasture lame- it will help her to have this support even in the pasture for now while we get her feeling good, repair concussion damage, be able to move comfortablely and grow some hoof mass in the right direction (down underneath her instead of out in front). The X-rays gave good information. It was super cool to have it done! Thankfully there’s nothing of great concern and she has enough sole depth that thin soles (what we thought could be the cause for sensitivity) is not a concern. Her bone structure (especially from the filing I’ve done to pull her toes back under her) is looking good overall. She seems to have a slight difference in bearing weight to the inside on her left hoof so we’ll keep an eye on that as well. There is a slight trace of early pedal osteitis starting in her right coffin bone (in the hoof). It’s reversible and not too bad yet so we caught it early. This is from concussion damage and I wince to imagine how much of it was due to the iron mountain ride. The best thing we can do now is get her back in shoes as soon as possible and always always use pads for now to give her good heel support and ‘shock’ relief. What you don’t know. What there is to learn… one reason I’m in love with this sport. I have learned a ridiculous amount in 2 short years of endurance. No. In the wild horses don’t get to see a farrier. 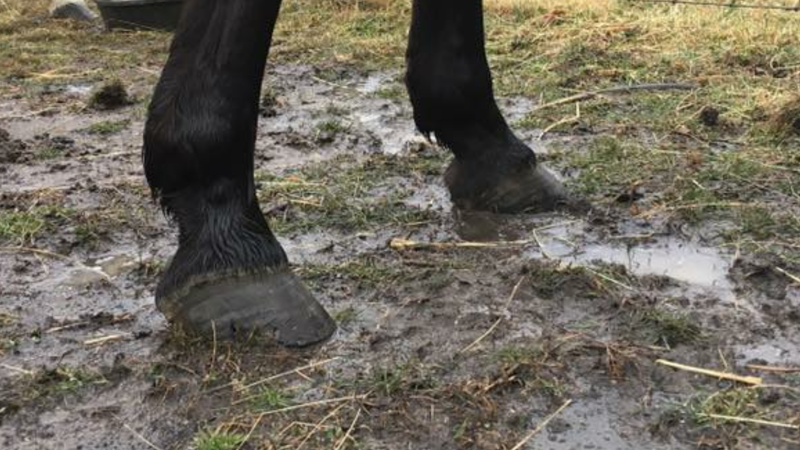 And there is a pretty vocal group of ‘natural’ horsepeople who say that all horses can and should be barefoot with a proper ‘barefoot trim’ in order to be healthy. 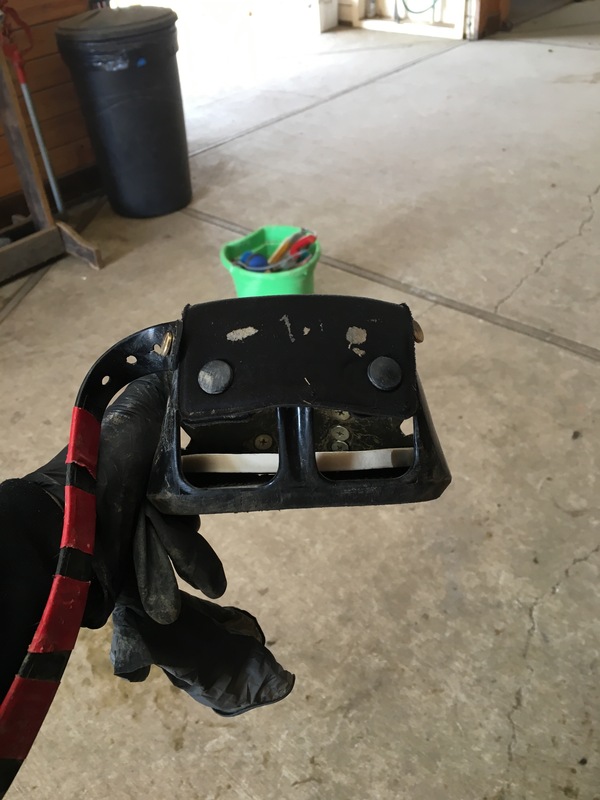 I’ve been told that metal shoes is one of the worst things we do to our domestic horses. 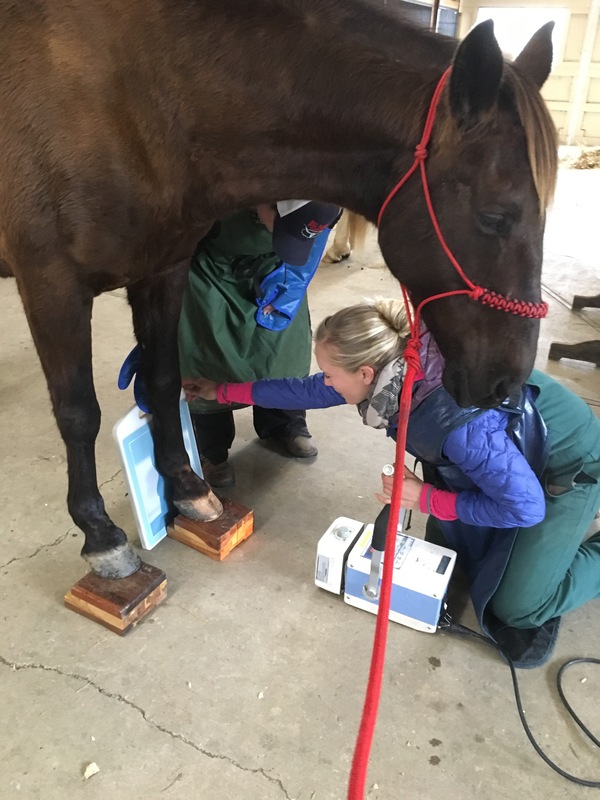 As a recent article reminded me horses in the wild – who normally have the best feet because the ones without have been taken out of the gene pool- actually have pretty widespread occurrences of laminitis and hoof pain problems in a recent study. And last I checked horses in the wild aren’t expected to race through 50 or 100 miles in a day at speeds greater than a walk. That being said Wild Heart genetically has those amazing wild hooves that will probably not need a lot of protection depending on what we ask of her. 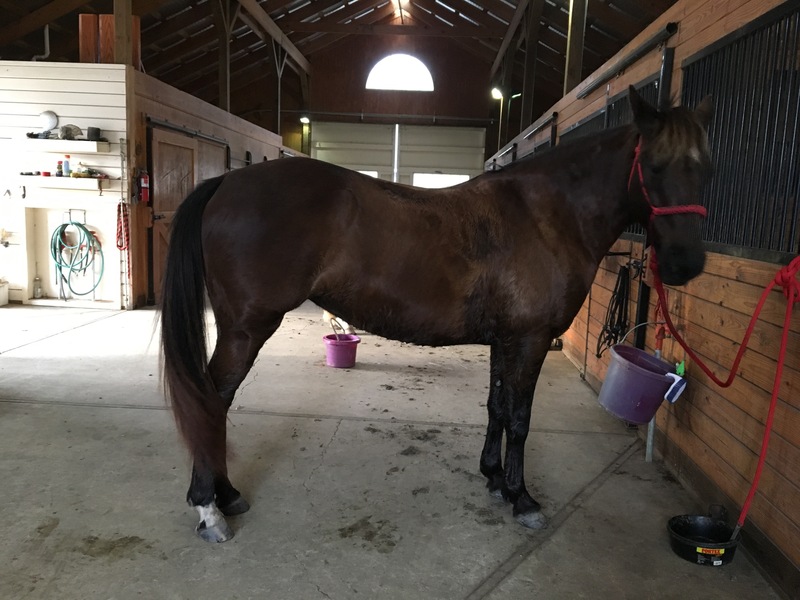 Khaleesi though basically feral is human bred for many things with hooves being just one component and no paddock paradise is going to get her sorted out without some help along the way from a good farrier and some shoes. I suppose another thought is that I’m just not willing to take two or more years to not work her and revamp her feet during the prime of her early career in hope that they will come around with trimming, nutrition and pasture test… that can’t be the best answer for her all around. 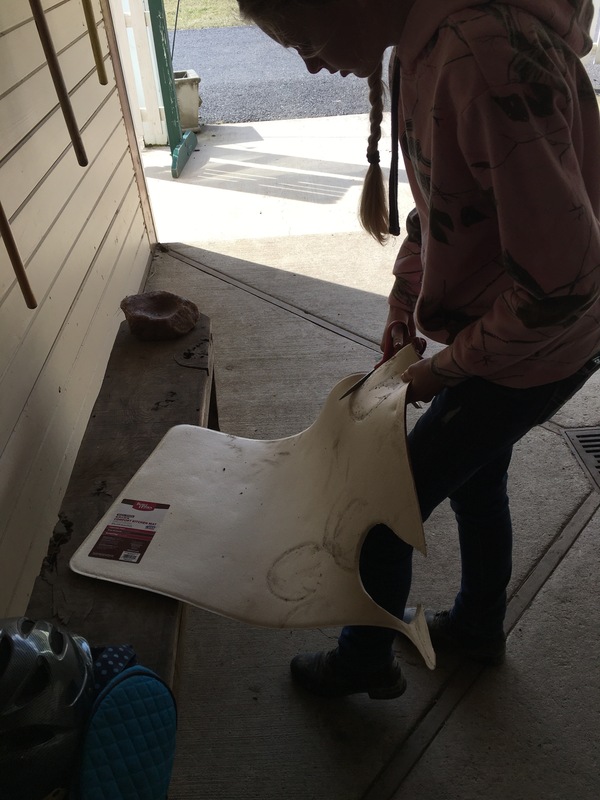 So if your horse does well barefoot with occasional protection (like Faygo) then great! 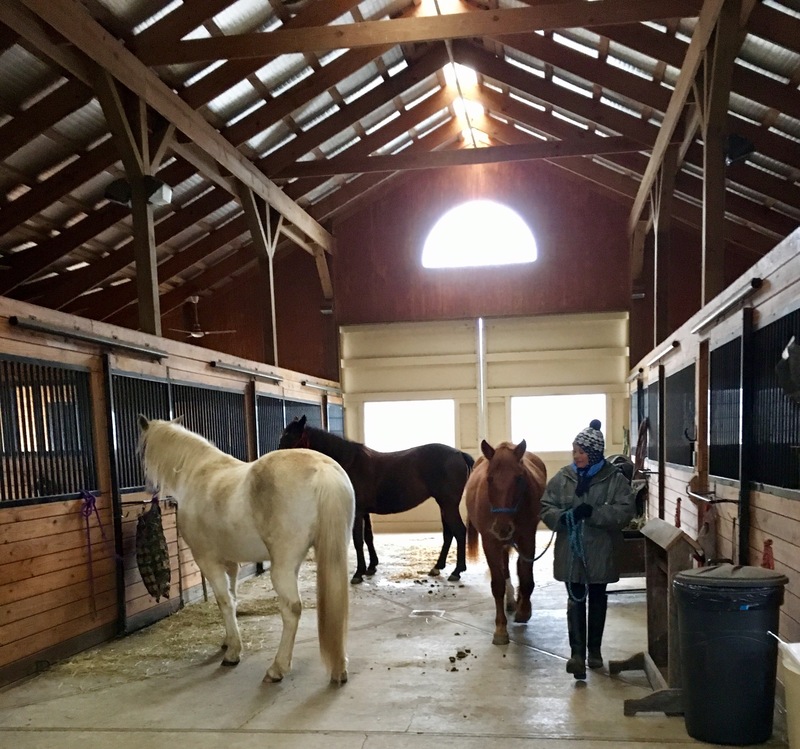 But what I learned about K these past 2 years is that she is not better off without shoes, in fact they will help her longevity and comfort for the time being not to mention be an important tool in correcting the issues that her ‘natural’ hoof for years living ‘wild’ contributed to. Speaking of hoof boots…Until the shoes and pads… I thought I’d try something on my own. 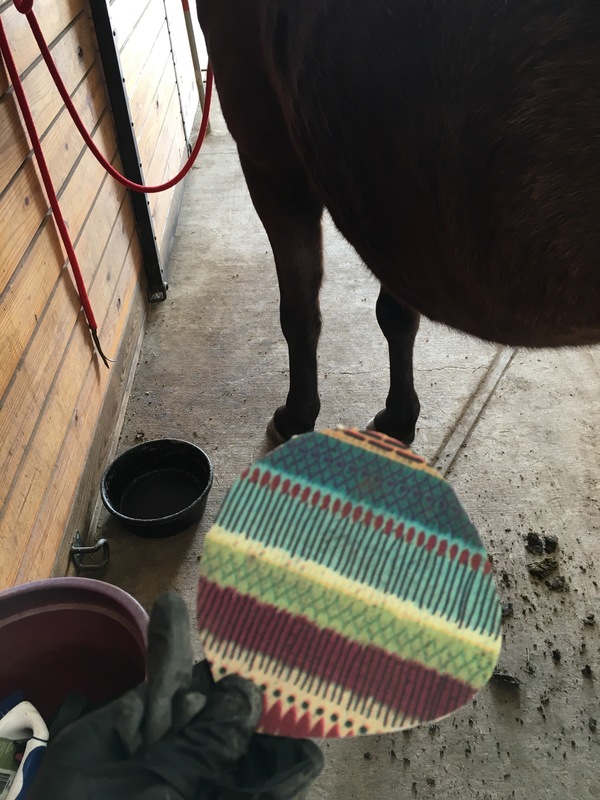 I rode a short 7 mile ride over the weekend and experimented with making my own hoof boot pads. They didn’t seem to make a big difference in her taking on the rocky sections, and added weight to her front legs (minimal but the weight on a foot is exponential compared to weight carried on the back. Just a few ounces on a foot can equal pounds carried balanced on their back). She was less coordinated if anything and not noticeably faster. Upon returning home I pulled the pad out and her 1000 pounds had completely flattened the ergonomic foam. Well…. 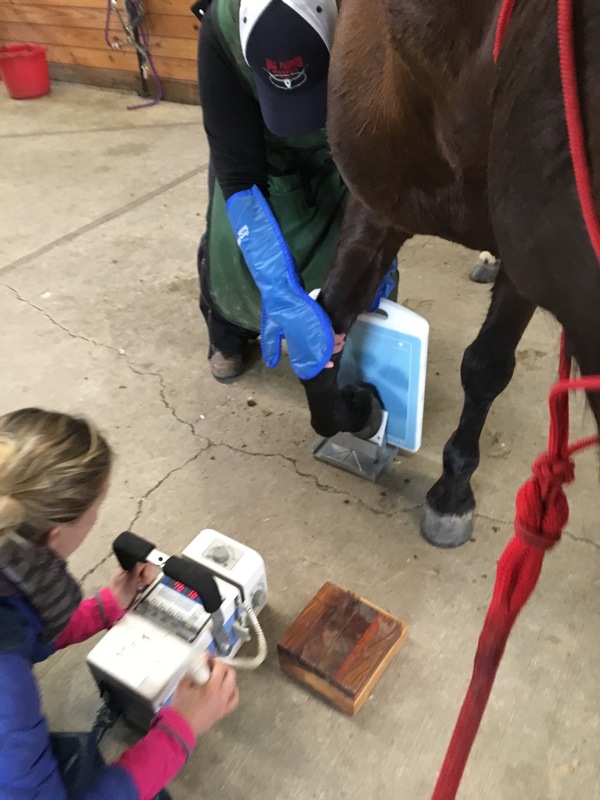 ok.
Kelly and my farrier have conferred over the X-rays and agree on the game plan and shoes and pads are going on tomorrow to get us back on the trail. I always appreciate how much my farrier will do to keep his horses competitive and in their best hoof health. I never expect him to drop everything and come running but he always finds a way to fit us in when we need him. We are planning a long ride Saturday with some friends that will be more challenging training buddies (100 mile horses). Sometimes it seems that 100 is an eternity away for us. Next: Next post: Test run. 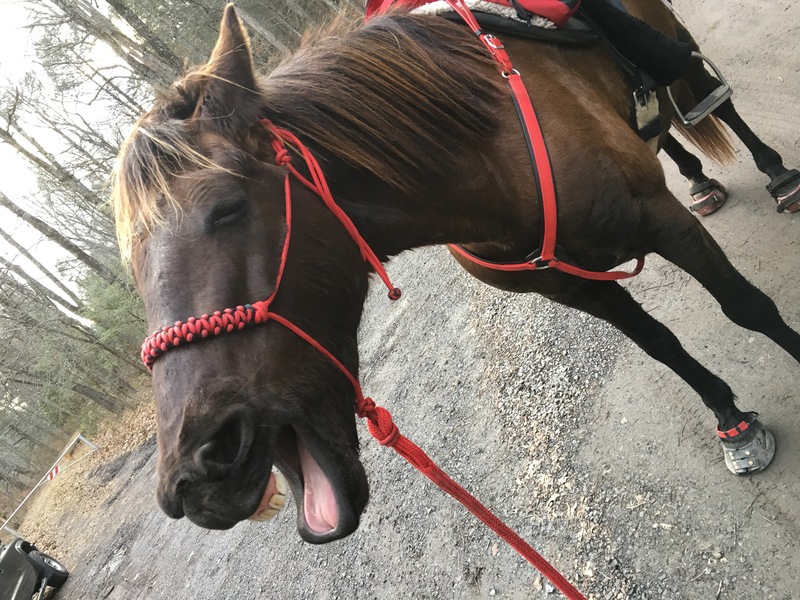 My main endurance horse has always been “off” after rides with hardpack trails. And, if we’re alone that last loop,I joke that he’s going through the phases of grief (anger, depression, sorrow, etc). 2 rides he’s come up sound at the end, but he’s seemed off. And one ride, stepped off the trailer completely lame on his LF. Never thought anything of it. So, when my vet was out, I had X-Rays done too after he confirmed it wasn’t a suspensory issue. Sure enough, thin soles (7.8 on one and 8.5 on the other). Also said shoes and pads. I’m going to be trying the Ground Controls as, here in Texas, we just don’t have that many rocky rides (there’s really only 1 I’m planning on attending) and I can do a pour in prior to the ride. However, no lies, I went through about 3 days of emotional resistance. My rational mind agreed, understood, and felt HORRIBLE for what I’d done. But my emotional side was still resisting. And when the options are “Give your horse the competitive season off and see if you can’t push back the toe [mine grows a crazy length of toe; I was having to push his fronts back weekly and rears bi-weekly]” or “Put shoes on and keep competing AND make your horse comfortable”, well, eventually my emotions settled down. Thanks for the comment! So much to learn in this sport- I am interested in the easyshoe ng at some point on her fronts. 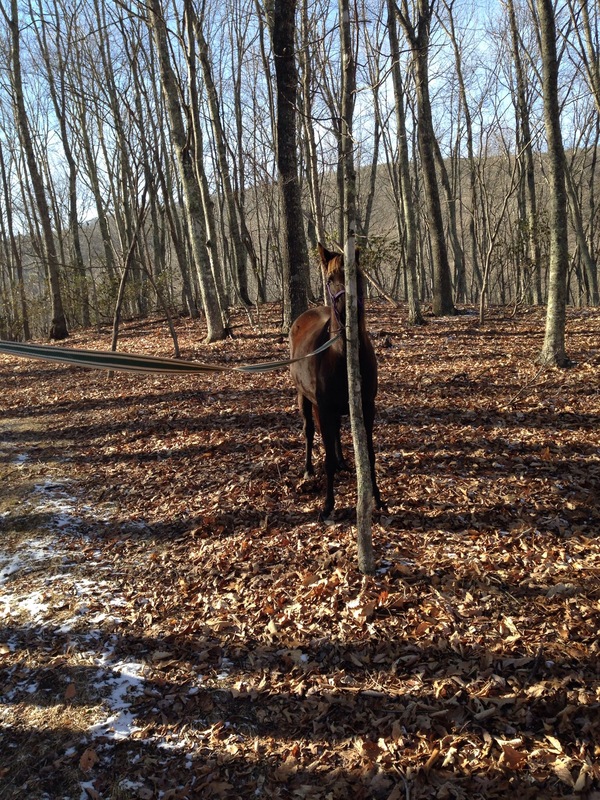 Today she was just back in metal and pads and she’s already so much happier out moving along the trail. 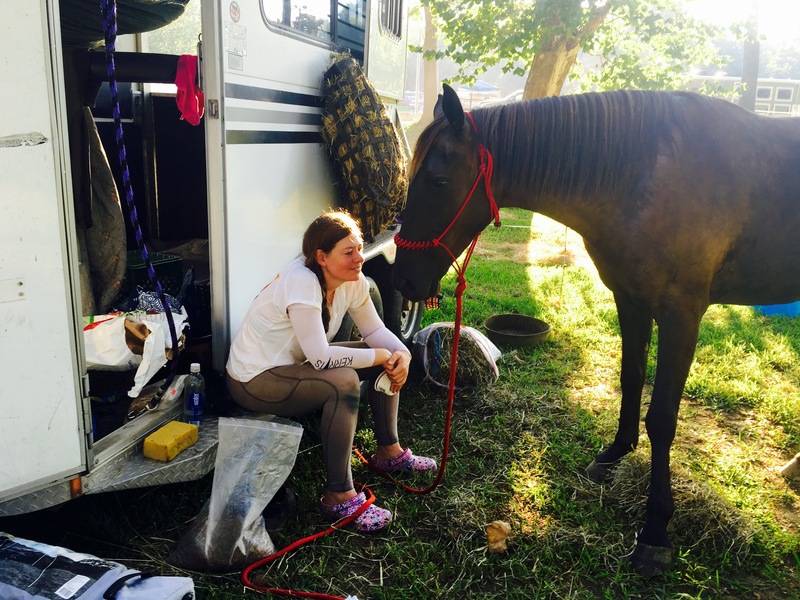 I’m not anti-shoe and I’m not anti-barefoot, mine have been both…I am PRO what works best for your horse and your situation. The ‘natural’ arguments drive me absolutely bat s*%t crazy. NOTHING about what we do is ‘natural’ with our domesticated horses, so to believe ‘natural’ practices are best just doesn’t apply. Our horse don’t live in the wild, plan and simple, therefore, we have to adjust to the fact that we cannot treat them as if they do.